About Paul Lindblad: Paul Lindblad received his undergraduate degree in Music Education and a Master's Degree in Church Music from Concordia University, River Forest, Illinois. Mr. Lindblad earned a Kodály Certificate from Silver Lake College, Manitowoc, Wisconsin. He has studied with Paul Christiansen, world famous choral conductor; and Katinka Daniel, International Kodály music education specialist. Mr. Lindblad has done extensive studies in organ performance, vocal technique, and conducting under the mentorships of Victor Hildner and Douglas Neslund. Mr. Lindblad currently conducts the Oak Park Concert Chorale and St. John Choristers (previously Paul Lindblad Choristers). He is the Director of Liturgics at St. John Lutheran Church in Forest Park. The Friends of Music Schedule can be found here. The heart of worship is God. God calls his people to worship. God cares for his flock. God gives gifts to us during worship, in Word and Sacraments, and we respond with confession, praise, thanksgiving, and commitment. God’s greatest gift is Jesus Christ and our worship therefore focuses on him. Worship invites your participation through listening, speaking, singing, and praying. St. John worships in a traditional style, complete with organ, choir, and liturgy. You are invited to become part of the Music Ministry at St. John. Vocal and instrumental opportunities abound for all age ranges and experience levels. Our Music Ministry offers glory to God, fellowship, and a chance to expand your musical horizons. This Emerson piano was dedicated in August, 1999. It was built in 1897 the year Brahms died. It was completely rebuilt by Renaissance Craftsmen Restoration, Inc. of Forest Park. The Emerson Piano Company began in 1849 in Boston building low priced instruments. In 1854 Mr. Emerson hired C.C. Briggs to improve the piano. This was accomplished with much success and the reputation for superior quality was soon established. Through the years the Emerson piano was continually improved to maintain its position as a high class instrument. 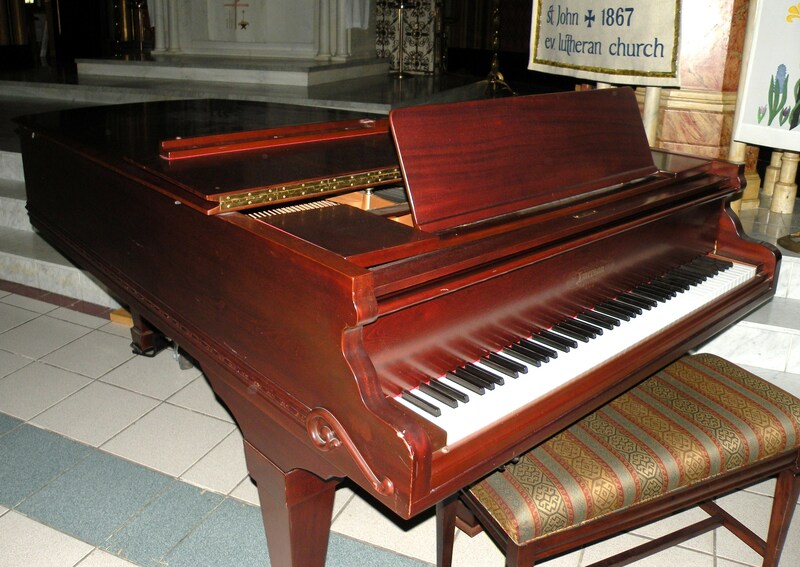 As with our organ this piano was purchased and fully restored through the generosity of the members of St. John. Dedicated on June 20, 1954, this organ was built by the Aeolian-Skinner Organ Company of Boston, to specifications prepared by Hugo Gehrke. The final finishing and voicing was supervised by the late G. Donald Harrison, president of the Skinner Company. The original organ consisted of 2,550 pipes divided into 44 ranks. However, it included provisions for additional ranks and many were added through the years. The organ was primarily designed as an instrument to lead the congregation in singing praises to our Lord. Thus, it is supplied with 19 ranks of diapason pipes, of various pitches, from the deepest bass to the highest audible treble, providing a glorious mass of pure organ tone for the singing of chorales, hymns, and liturgy. Corresponding to the brasses in an orchestra, the Trompete, Fagott, Posaune and Kornett are used in the organ to bring out the melody of a chorale or hymn with added force and intensity and to provide the organ with thrilling climax on festival occasions. The softer-toned flutes, gambas, and dulcianas, as well as the solo Krummhorn and Vox Humana, are useful especially in organ voluntaries. To these stops more can be added to produce new and different tones. The design and voicing of the organ is predicated on the style of Lutheran Church organs built in the golden age of church music in Germany more than two centuries ago with a contemporary adaptation. In order to present the glorious treasures of Lutheran church music properly, it is necessary to invest the instrument with the kind of tone qualities which the composers of the golden age had in such rich abundance in their great organs. On May 9, 1976 the positive section was dedicated.. The specifications and complete design of the pipe work were drawn by the late Paul Bunjes of Concordia University, River Forest, IL. St. John is deeply indebted to him for his untiring and artistic genius. 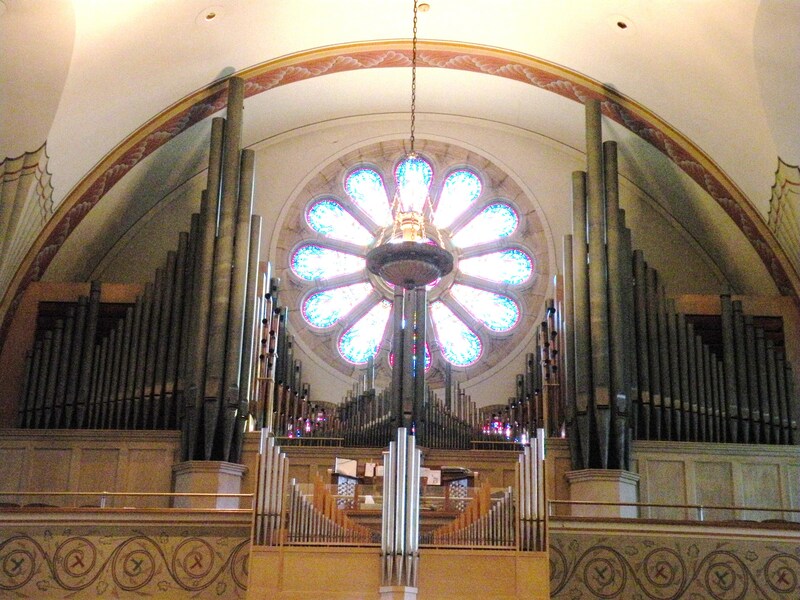 The precise and deliberate care in the construction and installation of the organ was done by the Berghaus Organ Co. of Bellwood, IL. This Rueckpositiv section is unenclosed. Included with the installation was the addition of the Ceremonial Trompete in the Great. Placed as a façade to the unenclosed Grat, the tones of the copper-hooded trumpet pipes, manufactured by the Giesecke Company of Gottingen, Germany bring forth a thrilling sound in accentuating the cantus firmus of chorales in musical literature. This addition to the organ was made possible exclusively from memorials given by members and friends in memory of their loved ones. Facing the organ from the chancel, one is impressed with the beautiful design of the pipe display, symbolic of a crown. In 1937 a number of families memorialized their loved ones with a set of 24 chimes.